Then I asked why had he decided to make a missile. Here is our conversation verbatim. ‘Don’t you like it?,’ he asked. I hadn’t told my son about this. Why would I say such things to a 10-year-old boy? …Home, street, school, radio, TV… The breathing sound of the tragedy is everywhere – on 26 February this year it was 18 years since the Khojaly massacre. I retreated to my room. The most dreadful, horrifying and painful memories which I always tried to hide as far as possible were resurfacing. The road leading me there was a path in an unknown direction. The hands and feet that eventually became gangrenous … People left their homes wearing only their night-gowns, walked barefoot along secret paths covered with snow, bypassed mountains and forests. Several days later they reached Agdam in groups of five and 10. They spoke about what they had gone through, not in sentences but in separate words, syllables, as if a doctor were administering medicine in doses. However, my grandmother never told me to hate Armenians! I know that Armenians raise their children in the spirit of hatred for Turks and Azeris. Hatred is connected with memory. There was no hatred left in our memories. In evidence of that, tens of thousands of Azeri men fell in love with Armenian girls and married them. Hundreds of thousands of fathers, mothers, grandfathers and grandmothers accepted these Armenian girls into their families. Thousands of kids were born to these families. After so many people have left our country, it is still home to about 30,000 Armenian women. These are official statistics, while the unofficial figure is even higher. Would a hating nation have done that? But can anyone show me an Armenian family that has made an Azerbaijani girl a woman and still accepts her? Can anyone show me such an Armenian father, mother, grandfather and grandmother? I am not talking about exceptional cases; I am talking of thousands, tens of thousands. The Serbs killed up to 10,000 Bosnians in Srebrenica, just because they were Muslims. I saw Bosnia’s devastated villages in 1997 with my own eyes. Up to 800,000 people were killed in Rwanda in a matter of 100 days. The rate at which people were slaughtered here exceeds that of Nazi concentration camps. The town of Khojaly was wiped out from the surface of the Earth in just one night. 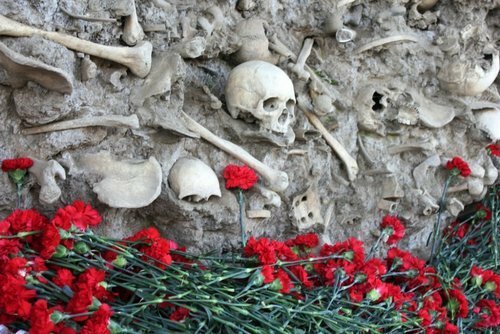 Armenians killed 613, crippled 487 people, while 1,275 civilians, including the elderly, kids and women, were taken prisoner and exposed to inhuman torture. Just because they were Azeris. The whereabouts of 150 people are still unknown. Of those killed, 106 were women and 63 children. Eight families were destroyed completely, 24 children lost both parents. Only 335 of those killed were buried, the legs of 200 people had to be amputated due to the cold. The crime committed with the intention of sowing panic was not just an offence by a group of thugs, it was a premeditated political decision aimed at intimidating people, ousting them from their homes, conducting ethnic cleansing, eliminating the traces of previous owners of vacated territories and ‘restoring’ the ‘ancient’ Armenian land, seizing a lot of land for Armenia and expanding it to cover a territory between three seas. The lands the Armenians laid claims to at the 1919 Paris Peace Conference extended from the Caspian Sea to the Black Sea and the Mediterranean Sea. . They still have the same claims today. A country with a population of three million has claims on a territory inhabited by over 300 million people. Wouldn’t it look even more reasonable if three million Mongolians started to lay claims to territory now inhabited by over three billion people but which was once ruled by Genghis Khan? On 4 March 2010, the International Relations Committee of the US Congress House of Representatives passed a resolution to officially recognize the policy of the Ottoman Empire in 1915 towards Armenians as ‘genocide’. Despite all the efforts of Turkey, the US Congress took this step. The process may be suspended at the next stage, but this will hardly change anything. What Zbigniew Brzezinski described as the ‘chess game’ of politics has long been under way. The essence of Armenian suffering is deliberately distorted. The hostile description of Turkey and, especially, Germany is intended to justify the US government’s belligerent policies. The suggestion was accepted and the main document the Armenians would subsequently refer to in order to substantiate their genocide claims (a book called Ambassador Morgenthau’s Story) was published in 1918. His suggestion was subsequently used as a means of pressure on other countries and became known as ‘genocide’. The revenge for Khojaly cannot be exacted by another ‘Khojaly’ on Armenian territory. Only when those guilty of the carnage are brought before the international tribunal (as was the case with the Nuremberg trial) and when Armenian people sincerely regret and apologize (as Germany did with the Holocaust) can the problem be closed. There is a disease called the ‘recurrent Armenian disease’ (familial Mediterranean fever). Even though sometimes it applies to such Middle Eastern nations as the Arabs, Jews and even Turks, its name relates to Armenia. It is characterized by stomach pains accompanied by a high fever. But I also know a disease called ‘Armenian hatred’. This is known only to Armenia’s neighbors. The disease is communicable and I would not want it to infect us. Please keep this virus of hatred as far as possible from us! I returned to my son’s room. I didn’t know what he was thinking about. And I didn’t even ask. I took his present and put it on a bookshelf as a talisman to protect us from the disease of hatred. 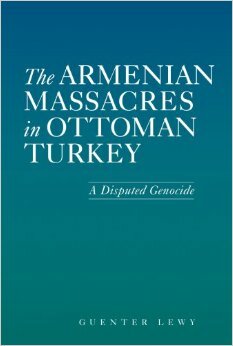 Guenter Lewy: The Armenian Massacres in Ottoman Turkey, pp. 252-253. The University of Utah Press, 2005. Bu yazı IN ENGLİSH, Qarabağ içində dərc edildi və Ambassador Morgenthau’s Story, genocide, Guenter Lewy, Henry Morgenthau, Karabakh, Khojaly, recurrent Armenian disease olaraq etiketləndi. Daimi bağlantını seçilmişlərinizə əlavə edin.